In the years preceding the devastating 1997 flood and the “living [natural] river” flood project that followed, an attempt was already under way to educate northern Nevadans about the wisdom of restoring the Truckee River to a more pristine state—i.e., to undo the “unnatural” engineering of the United States Corps of Engineers three decades earlier. 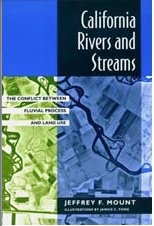 One of the seminal arguing points in this effort was Jeffrey Mount’s 1995 book California Rivers and Streams. geomorphic systems, working with them rather than against them, “we might have spared ourselves much of the calamity that marks the beginning of 1995” when heavy flooding afflicted both northern and southern California. Logging proved detrimental, but worse was hydraulic mining in the Sierra that poured huge amounts of sediment into the rivers, plugging them and worsening floods. Government responded not by asking residents to live with nature but by altering it drastically. It did this by dredging rivers to increase their capacity, reconfiguring them into straight-jacket channels that often were lined with cement, building an ever-expanding levee system, and creating hundreds of dams. Dredging proved an illusory safeguard, as rivers often quickly refilled their beds with sediment which drastically reduced the expected flood protection. Channelization, designed to move water faster and more efficiently through the danger zone, inevitably poured more water onto unprotected areas upstream and downstream. So did levees, creating new and greater flooding that led to more demands for flood control. The levees themselves sometimes failed, but more often simply proved inadequate to the job. Many had been designed with just enough freeboard to meet National Flood Insurance Protection limitations for development in the 100-year-floodplain (the area that would be flooded on average once every hundred years). In short, each of the engineering solutions exacerbated the imbalances created by urbanization of the watershed. This led, again, to greater flooding and even more extensive engineering solutions. In his preface, Mount says his book “does not attempt to solve the problems that face California rivers…. There are no recipes for solving land use problems, no designs for mitigating impacts.” His goal is merely to state the problem. Nevertheless, the reader finds a clear message that humans should work with the natural river as much as possible. And Mount does specifically say that levees should be located farther away from rivers in order to let them meander more naturally with riffles, pools and riparian vegetation, creating space for water storage during floods—one of the tactics proposed for the Truckee. —The removal of riparian (riverbank) vegetation in favor of concrete and riprap is an expensive non-solution because the roots of trees and other vegetation are often just as effective as non-natural engineered solutions in stabilizing the banks. —Many of California’s water projects were created to irrigate farmland, a particularly wasteful and expensive use of water in a semi-arid state. For instance, alfalfa, pasture, cotton, and rice receive one-third to one-half of the total amount of water used for agriculture, but they earn less than 10 percent of the $20 billion crop income and account for less than 0.3 percent of all goods and services produced in the state. This folly is subsidized by water that is far cheaper than urban water: in some places, $12 an acre-foot compared to $455 to $875 an acre-foot. These observations by Mount presaged the growing struggle in the West between “wasteful” agriculture and the growing cities that seek the farmers’ water. This ferment could be seen in Reno and Sparks in the late twentieth-early twenty-first century as the two cities eyed the Truckee River water being diverted to farmers in Fallon.